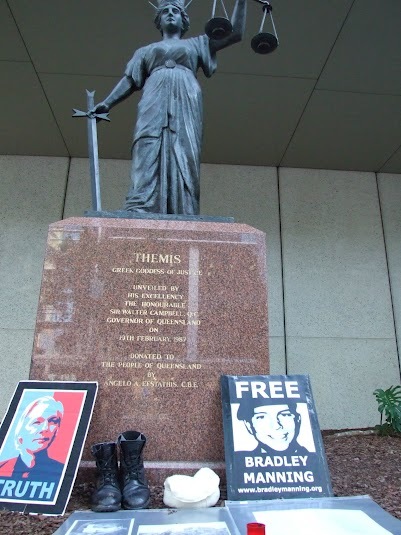 Four solidarity events were organised by supporters from the WISE Up network this week as Bradley Manning was back in court for another pretrial hearing. These were in Chester, London and Exeter as well as Brisbane, organised by our man in Oz, Ciaron. The Brisbane event on 6 June was first in the series, given the nine hour time difference. 12 people held a vigil from 2-6pm local time outside the Supreme Court near the statue of Themis, decorated with images and artefacts and transformed into a shrine for the collateral damage of U.S. led (Australian and British following) wars in Iraq and Afghanistan with a pair of combat boots, a traditional Afghan hat, images of war dead, Bradley Manning, Julian Assange and right slap in the middle an image of ‘Obama Torturer’. The vigil continued through peak hours with lots of pedestrian traffic, lots of lawyers and judges and the like passing by. The Chester vigil was also held on 6 June. 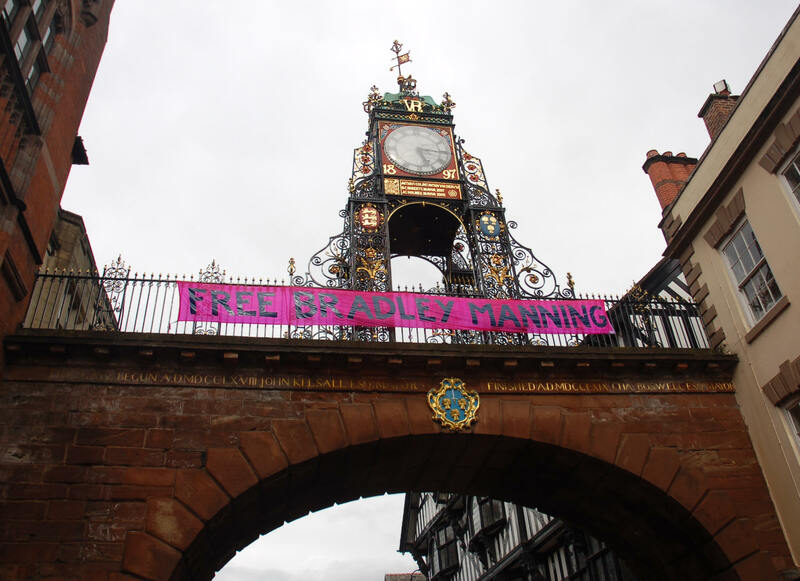 Our fluorescent pink banner was displayed from 3pm – 5.30pm under Chester’s most prominent landmark, the Queen Victoria Diamond Jubilee Eastgate clock on the city walls as they cross the main shopping thoroughfare. This attracted the attention of many tourists and their camearas. Leaflets and sunflower seeds were handed out from the arch underneath the clock and we had good conversations with interested passers by, several of whom signed up to get involved. Report on the vigil along with a few more photos here. The solidarity event in Exeter went ahead on 8 June in spite of gale force winds but later than planned. 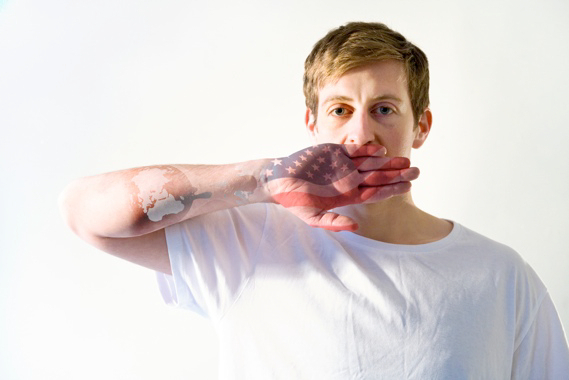 “Information was handed out about Bradley, the upcoming play in Exeter, about how the Court Martial is playing, as well as the ‘War on Terror’ and transparency issues, WikiLeaks, and Julian’s case at the Supreme Court. 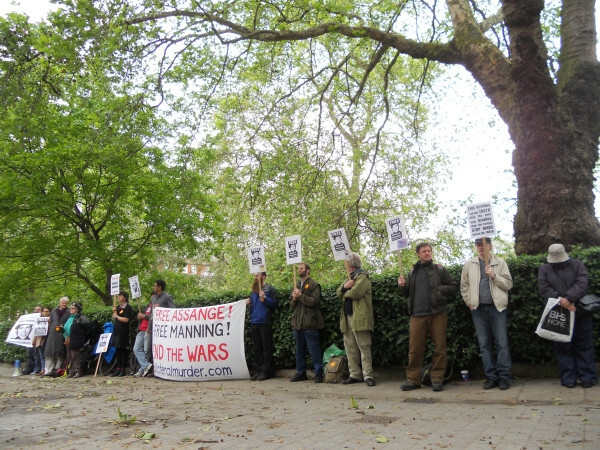 23 people attended the vigil in London outside the US Embassy from 3pm on 8 June. Read more about this week’s motion hearing here. Gallery | This entry was posted in Manning, Reports and tagged Australia, Brisbane, Catholic Worker, Chester, Exeter, London, solidarity, Veterans for Peace, vigil. Bookmark the permalink.